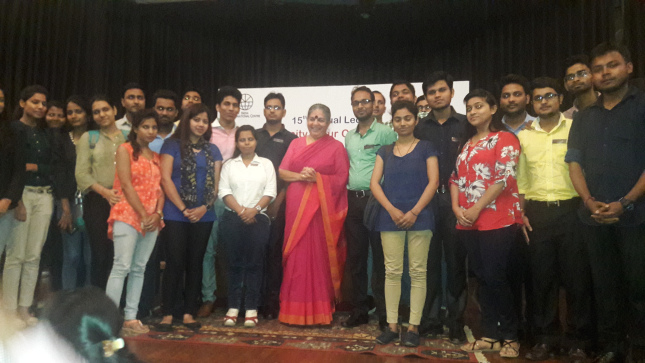 Asian Education Group organized the visit for the students of PGDM (2016-18) batch to the 15th annual Lecture by Dr. Vandana Shiva. She is an environmentalist and has authored almost twenty books. She is one of the leaders and board members of the International Forum on Globalization and a figure of the global solidarity movement known as the alter-globalization movement. She has argued for the wisdom of many traditional practices, as is evident from her interview in the book Vedic Ecology that draws upon India’s Vedic heritage. She is a member of the scientific committee of the Foundation, Spain’s Socialist Party’s think tank. She is also a member of the International Organization for a Participatory Society. She received the Right Livelihood Award in 1993, and numerous other prizes. She spoke about the ways we can preserve our economic ecology and make our world a better world. Asianites got a learn a lot about globalization movement. Such interactions enhance their understanding about larger problems faced by the world.